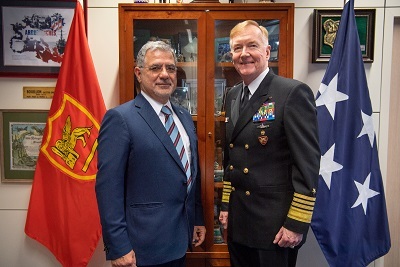 On 25 March 2019, PAM Secretary General Ambassador Sergio Piazzi paid an official visit to the NATO Allied Joint Force Command (JFC) Naples. He held two meetings respectively with Admiral James Foggo III, Commander of the JFC, US Naval Forces Europe and US Naval Forces Africa; and with Brigadier General Ignazio Lax, Director of the NATO Strategic South Hub (NSDS Hub), among other NATO officials. Mr. Francesco Senese, PAM Liaison Officer, accompanied the Secretary General. Ambassador Piazzi was briefed in detail about the activities and programs of the NATO Command and of the Hub, and in return, he informed NATO officials about the outcome of the 13th PAM Plenary Session, at which the Assembly had confirmed its strategic cooperation with NATO through the establishment of a structured cooperation with the JFC and the NSDS Hub in Naples. PAM briefing included a presentation of the activities of the Assembly and of the reports and resolutions on Regional Security and Counter Terrorism adopted in Belgrade. NSDS Hub was opened in July 2018, and its purpose is to increase NATO’s collective understanding by being a forum for engagement and information sharing focused on the threats, challenges and opportunities coming from the South, namely in the MENA region, the Sahara and Sahel regions. This strategic geographical area presents a number of security challenges, including terrorist activity, arms trafficking, organized trans-national crime, irregular migration routes and human trafficking, all of which affect the wider Euro-Mediterranean region. Moreover, a partnership framework called NATO’s Mediterranean Dialogue, which initiated in 1994, currently involves seven non-NATO countries of the Mediterranean region: Algeria, Egypt, Israel, Jordan, Mauritania, Morocco and Tunisia. Several other NATO cooperation programmes also take place in the Western Balkans and Central Europe. All the countries involved in these programs are members of PAM. The need to secure and properly develop this region is a priority for PAM and has been the subject of discussion in many recent conferences, including the Parliamentary Meeting of the 5+5 Western Mediterranean Forum, which PAM co-organised in Malta in January 2019. The nexus between security and population movements will be further examined by PAM delegates at the upcoming high-level conference in Turkey next June. Ambassador Piazzi also informed NATO senior officials about the establishment of the PAM Euro-Mediterranean Regional Research and Coordination Centre in Naples, which will, inter-alia, be responsible for day-to-day partnership with the NSDS Hub.